Are you looking for that fun but elegant perfect Gift Basket? Well, look no more because "Jaybee's Gourmet Gift Basket" is just what you need for a sophisticated delightful presentation to match the mood, and articulately relay your well-wishes in a fun and graceful way! - This gourmet gift is a healthful source of protein and many other nutrients. Nuts were hand-selected for quality and freshness making it the perfect gift for every occasion. - Featuring freshly roasted and smoked almonds, cashews, honey roasted peanuts and tasty toffee peanuts. - Our buyers were so pleased that we are confident that you will too. So go ahead and press "Add To Cart" you won't regret it you'll see, because that's our "Jaybee guarantee". • DELIGHT YOUR RECIPIENT with the nicest gourmet gift tray on Amazon. This beautiful sectional gift tray is artfully designed and tastefully arranged to please anyone and everyone. Just try it and you'll see - they will all love Jaybee. • A HEALTHFUL VARIETY of great quality, deliciously roasted nuts including, smoked almonds, pecans, cashews and tasty toffee peanuts that were hand-selected to ensure the highest quality. • YOUR WISHES WILL BE WELL RECEIVED with Jaybee's Gourmet Gift Basket as we effectively relay your message and create a wonderful gifting experience. • THE PERFECT GIFT THAT CAN'T GO WRONG. 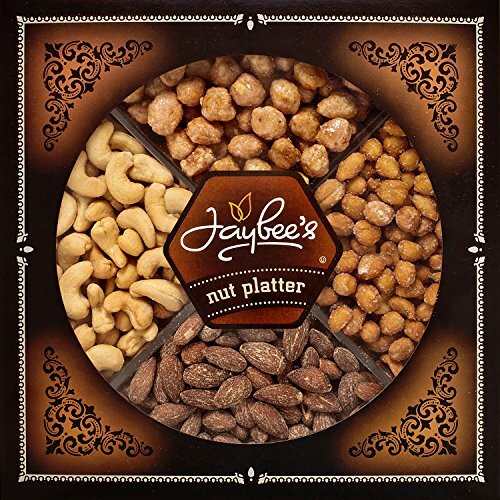 Jaybee's nut baskets wonderfully suited for any occasion, corporate, birthday, congratulations, get-well, condolence, holiday and will bring a smile to every recipient. • YOU WILL BE SATISFIED WITH YOUR PURCHASE- If by any chance your recipient is not satisfied with our delicious gourmet gift basket, we will refund your money back. Even though that's highly improbable, because we don't disappoint. If you have any questions about this product by Jaybee's, contact us by completing and submitting the form below. If you are looking for a specif part number, please include it with your message.